Human behaviour is infinitely complex, the result of thousands of interactions between predispositions, external factors and physical and cognitive processes. It is also highly unpredictable, which makes meaningful social engagement difficult without the aid of some external framework such as that offered by an institution. 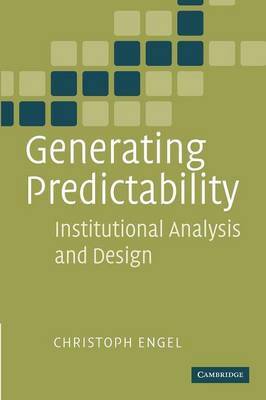 Both formal and informal institutions can provide the element of predictability necessary for successful, complex interactions, a factor which is often overlooked by institutional analysts and designers. Drawing on a wide range of disciplines including psychology, economics, and sociological and political studies, this book develops a coherent and accessible theory for explaining the unpredictability of individual behaviour. The author then highlights the danger of institutional reforms undermining the very capacity to generate predictability which is so central to their success. This book will appeal to academics, researchers and professionals in many fields including management studies, behavioural economics and the new, interdisciplinary field of institutional design.